Remember the last Bull-Luterman trade (see A Corkscrew Trade)? We've done it again! Did Luterman take advantage of Bull this time? Or did Bull get the advantage? Or was it an even trade? You be the judge. Top: A rare German 1902 patent by Ferd Herbertz. It is marked ARCHIMEDES and DRGM 181644. Bottom left: An embossed bottle advertising "Chas. A. Zahn Co., Chicago, Ill., Old Stock Bourbon, A whiskey of quality." Bottom right: Bottle shape marked GRIFFON CUTLERY WORKS GERMANY with advertising "Drink American Club Beer, made by Lembeck & Betz, Eagle Brewing Co., Jersey City, N. J." 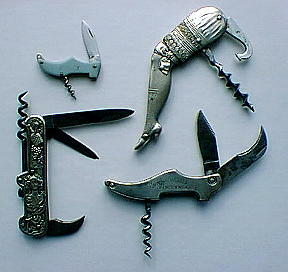 Top left: A small blue plastic shoe with cheesy worm and single knife blade. The blue plastic is stamped ANNECY. Lake Annecy in France is where Paul Chabas painted September Morn in 1912. Top right: Ornate leg waiter's friend Neckstand marked THE DETROIT PAT'D JULY 10 94. 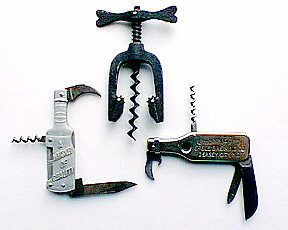 The patentee, Charles Puddefoot, worked with inventor David Davis at the Detroit Corkscrew Company. Bottom left: A simplified version of Carl Müller's 1896 German patent that has a pin mounted between the shoulders on the back of the knife. The shank of the worm slides under the pin and stops when its hooked end meets the pin. It is then swiveled on the pin and into position. This one pictures a woman with grapes and vines in her hair, a wine bottle, and a harp. The reverse has more grapes and in a scroll: "Wer nicht liebt Wein, Weib.u. Gesang. Der Bleibt ein Narr sein leben lang." The handles are nickel silver. The master and pen blades are marked FRED BROEKER. Broeker was a New Jersey importer of German knifes from 1920-1940. Bottom right: A French steel handle shoe advertising "Champagne Dassis Vincennes." So what do you think? Email your opinion to corkscrew@bullworks.net. Just indicate A, B or C.
Send comments if you like. Results and comments will be posted soon. toolman@rica.net: This one is close, but I give the nod to Bull for coming out ahead. fredcork@aol.com: Howard's passion for great mechanicals cost him this time. Bull wins. prjrs@bullhead.adp.unc.edu: If Howard's happy and Don's happy, it is an even trade. lbalvin@loop.com: The two shoes don't equal the two bottles, but when you throw in the womans face with grapes, "loving wine", you are dead ahead. The rare trick Fred Herbertz pulls Luterman ahead, but then you throw in the shapely thigh of a 1880's leg, well we have risque here, if it were 1880's we would have lewd here, and I would say that 'kicked' this trade over the edge, ooo la la. hlbenton@aol.com: I can't believe that someone with your knowledge could have someone get the best of him. nrcornell@aol.com: I think it was even; each got two great items in my opinion.